Ron Mock Worried About Tariffs? Ron Mock, president and CEO of the Ontario Teachers’ Pension Plan, joined BNN Bloomberg yesterday to discuss his investment prospects for 2019. Mock says global tariffs and government policies will be crucial to future market activity. I embedded the interview below and you can also watch it here. Ron spoke about concerns of tariffs and rising trade tensions because that's where "politics, egos and all sorts of things can come into play." Interestingly, he said that 18 months ago, Teachers' started bringing its equity allocation down "very substantially" from mid 40% to 33% "not as a view but as need to take volatility out of the portfolio as we felt we are going into a volatile period." He also said that Teachers' took $70 billion of foreign exchange exposure out of the portfolio and added "we've tried to insulate the portfolio as best we can against volatility" all while they maintain the return profile. He said the diversification benefits of having a global portfolio allows them to rebalance because what is going on in Asia isn't the same as Europe or the US. But he said they have people and boots on the ground all over as they have offices in Asia (Hong Kong), South America (Santiago, Chile), and Europe (London) and are keenly aware of government policies in these regions and how it impacts their portfolio. As far as the Fed, this interview took place yesterday, a day before today's meeting where the Fed raised rates and signaled two more rate hikes for next year. Ron said if the "Fed goes or holds, it won't make much of a difference" but he added "moderation is appropriate" as the yield curve is flat and global growth is slowing. I couldn't agree more but it seems the Fed is on a different page, looking at lagging economic indicators. An emerging markets crisis: As the Fed raises rates, sucking liquidity out of the global system, the odds of another crisis in emerging markets are on the rise, and so is the likelihood of a global synchronized downturn next year. This is why US long bonds (TLT) rallied today following the Fed's decision. That and everyone panicked so there was a massive flight to safety. I would say the odds of an emerging markets crisis went from 30% to 50%. Trump gets impeached in 2019: There is increasing chatter that President Trump gets impeached next year but some think the Mueller probe could turn out to be a disaster — for the Democrats. So, I would say the odds of a Trump impeachment are 30% right now going into the new year but truth be told, the stock market is acting like it's a done deal. Trump fires Fed Chairman Powell: After today, I would place the odds of Trump firing Powell and replacing him with Treasury Secretary Steven Mnuchin or Larry Kudlow or some other dove at roughly 60%. Trump follows the stock market very closely, he tweets about it and for him, it's a direct measure of the success of his presidency. He wants to be reelected and there's no way he will allow Jerome Powell or any other Fed Chairman to engineer a recession going into 2020. He has the power to fire and replace him and while the stock market will sell off hard on the news, it will recover and rally if a far more dovish Fed Chair takes over. What about tariffs? That's what Ron Mock and Teachers' are worried about. Well, Trump's protectionist policies got us into this mess and it's up to him and his team to manage them appropriately because if trade tensions only get worse, it will impact stock markets, and he can kiss his reelection bid goodbye. Trump is ruthless, he has proven it time and time again. He has made many mistakes but he will do whatever it takes to win another election, including firing Powell and backing off on tariffs if that's what it takes. If he wins a second term, the Chinese will have to start negotiating harder on trade and concede something significant. I'm getting way ahead of myself here, but stay tuned, volatility isn't over, not by a long shot. The only good news I can tell you is large global pensions, sovereign wealth funds, and institutional leveraged players need to rebalance their portfolio come the end of the month, away from bonds and back into stocks. So we may get a bit of a breather as we approach the end of the year and start a fresh new year. Maybe. That all remains to be seen. These markets are insane, scaring off retail investors and hurting a lot of institutional investors as well. No wonder everyone is looking to increase their allocation to private markets, the high-frequency algos and short-sellers shorting with no uptick rule have ruined public markets, for good in my opinion. 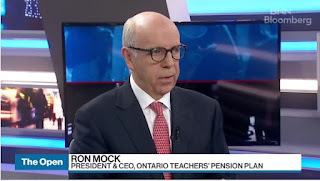 Below, Ron Mock, president and CEO of the Ontario Teachers’ Pension Plan, joins BNN Bloomberg to discuss his investment prospects for 2019. Great interview and very timely. Second, supporting what Ron stated, Charles Dumas, chief economist at TS Lombard, gave a gloomy outlook for the global economy in 2019, stating the trade war has had ‘huge’ impact on growth. Lastly, I embedded Fed Chair Jerome Powell's conference following the Fed's decision to raise rates. You can read the FOMC statement here. I wasn't very impressed with how this meeting was handled. I think at the very least the Fed could have stopped its balance sheet reduction and Powell was almost praising himself and their decision to raise rates (listen to news conference below). The FOMC could ignore Trump but it should listen to Druckenmiller, Gundlach and others who are more forward-looking. And it should read Francis Scotland's analysis on why the balance sheet matters and stop stating nonsense that the balance sheet reduction program will continue to proceed as planned. That's just foolish and dangerous. All this to say if Trump fires Powell and replaces him with a more dovish Fed Chair, I think a lot of people will publicly grumble but privately they will welcome the decision. Stay tuned. The Bad Santa Selloff of 2018? The Fed Grinch Who Stole Christmas? CPPIB Revamps its PE Program? Why Is the Market So Sick? More on Canada's Dirty Pension Secret? The Threats Facing Private Equity? Michael Sabia's New Paradigm for Growth? The Dirty Secret Behind Canada's Pensions? Beyond the Americans With Disabilities Act? CPPIB Invests in US Detention Firms? Can Pensions Beat a 60-40 Portfolio?